...the truth is that there are other plants and flowers that are more common and more dangerous to pets than poinsettias. One such flower is the lily. Lilies are one of the most dangerous flowers to have around cats. It takes only a nibble or lick to send a cat into acute kidney failure, which can be fatal. If you live with cats, never have lilies in the home. When sending flower bouquets to friends or family members with cats, specifically request no lilies. "True lilies" are those in the Lilium genus (e.g., Stargazer lily, Tiger lily, Easter lily, Japanese show lily, Asiatic lily, Rubrum lily, and others) as well as the Daylilies of the Hemerocallis genus They are beautiful, sweet-smelling flowers that are so common, you’ll find them everywhere from everyday table centerpieces to wedding bouquets. Unfortunately, they are also some of the most dangerous flowers to have around cats! It takes only a nibble on one leaf or stem, or the ingestion of a small amount of lily pollen (easy to do when a cat grooms itself) to send a cat into acute kidney failure and you rushing to the emergency vet. Acute kidney (renal) failure is always debilitating to your pet and expensive for you. The outlook for cats with acute kidney failure resulting from eating lilies can be good, so long as early and aggressive treatment is pursued. But if too much time passes before ingestion is recognized and appropriate treatment is started, the outlook becomes much worse and death from the disease or from euthanasia is more likely. The sad truth is that without treatment, acute kidney failure is going to be fatal. Treatment for lily-induced acute kidney failure involves aggressive IV fluids, injectable medications, nutritional support, and very close monitoring. If such treatment is proving unsuccessful, advanced options, such as peritoneal dialysis, continuous renal replacement therapy, or renal dialysis are considered. These treatments are not cheap and are also not available at all veterinary clinics. In fact, because treatment for acute kidney failure resulting from lily toxicity is so intense, it is best to have your cat treated at a specialty veterinary emergency hospital right from the get-go. Hospitalization and treatment costs for this condition will depend on the severity of the case and the cat’s response to therapy. It can safely be assumed, though, that a hospital bill will likely start at $2,000, and could increase to $4,000 or more. This is not a condition that can be conservatively treated – delay in starting the appropriate treatment both worsens the cat’s prognosis and increases treatment costs. 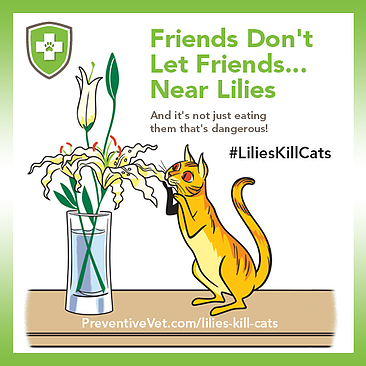 As you are hopefully appreciating, preventing your cat’s exposure to lilies is truly of the utmost importance, and there are several easy ways you can help prevent this toxicity. If you live with cats, never have lilies in the home. Regardless of how out of reach you think they may be, it’s just not worth the risk. Cats jump, dead leaves fall, vases spill, and pollen travels on breezes – any of these scenarios can kill your cat. Keep your cats indoors. Many people have lilies in their garden. If your cat is outdoors, unless they are in a secure outdoor enclosure (such as a catio or something like the Kittywalk System), there is no way to ensure that they will not eat or rub up against those lilies. When sending flower bouquets to friends or family members with cats, specifically request no lilies. To make sure they listen to your request, tell them that the recipient is deathly allergic to the flowers. Some florists may not be aware of the dangers of lilies to cats, and they don’t need to know that the ‘recipient’ you are referring to is your friend’s cat. Inform your friends and family members of the dangers of lilies to cats. The more people that know about the risk, the more cats we can save from lily toxicity and possible death. Please share our Lilies Kill Cats article and infographic. And see here for a more extensive list of poisonous plants and flowers – and some non-toxic alternatives. Do Lilies Kill Dogs, Too? Thankfully for dog lovers, the effect that the toxin in these lilies has on cat kidneys isn't seen in dog kidneys (or any other parts of dogs, for that matter). So no, the "true" lilies of the Lilium genus and the daylilies of the Hemerocallis genus are not toxic to dogs. A dog that nibbles on some of these lilies will usually only suffer some mild digestive upset, but their kidneys should keep on truckin' along just fine. Are Lily of the Valley, Peace Lilies, or Calla Lilies Dangerous to Cats or Dogs? Wondering about the lily of the valley plant? 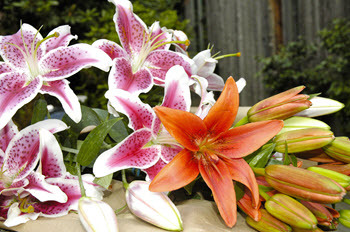 Or peace lilies and calla lilies? Though none of these are actual lilies and are in completely different genera than the "true lilies" and daylilies discussed above, they can cause problems for both cats and dogs... but in entirely different ways. Like the foxglove plant, the lily of the valley contains cardiac glycoside compounds that can cause the heart to beat abnormally (called an arrhythmia) and can lead to cardiac arrest for both cats and dogs (and people!). On the other hand (or paw, as the case may be), both peace lilies and calla lilies contain insoluble oxalates that can cause irritation and inflammation of the tongue and other tissues within the mouth, as well as the tissues of the digestive system, when swallowed. Very rarely, these insoluble oxalates can cause inflammation and swelling around the entrance to the trachea ("windpipe") and make it difficult for an affected cat or dog to breathe. So the short answer is "yes"—the lily of the valley, peace lily, and calla lily can all cause problems for both cats and dogs. The lily of the valley should be considered very toxic, given it's effect on the heart, while the peace and calla lilies would be considered only mildly toxic to both cats and dogs. Comparatively, the "true lilies" and daylilies talked about above are to be considered extremely toxic to cats (and non-toxic to dogs), given both their devastating effect on cat kidneys and how common they are in bouquets and as "stand alone" flowers and plants.